The best way to learn about a new culture is to be immersed in it: to wear its clothes and appreciate the beauty and history behind every needle and thread. 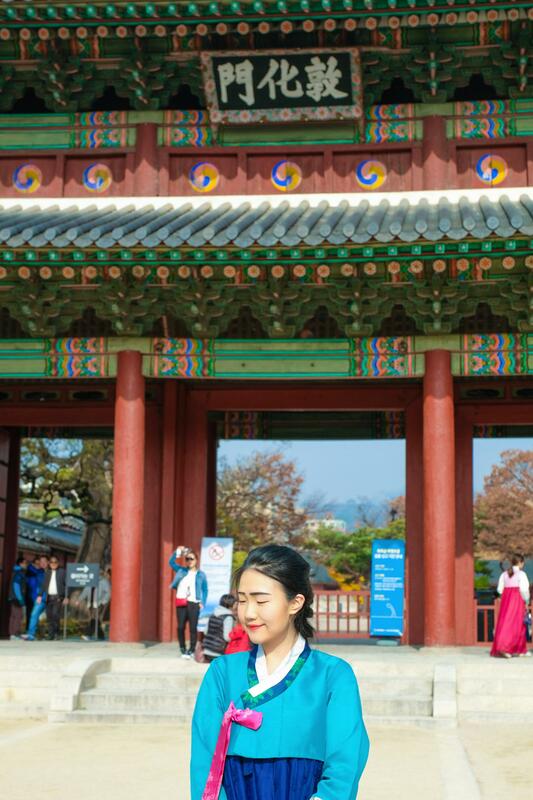 While I was in Seoul, I got the golden opportunity to try on a hanbok, which is a traditional Korean dress characterized by bright colors. 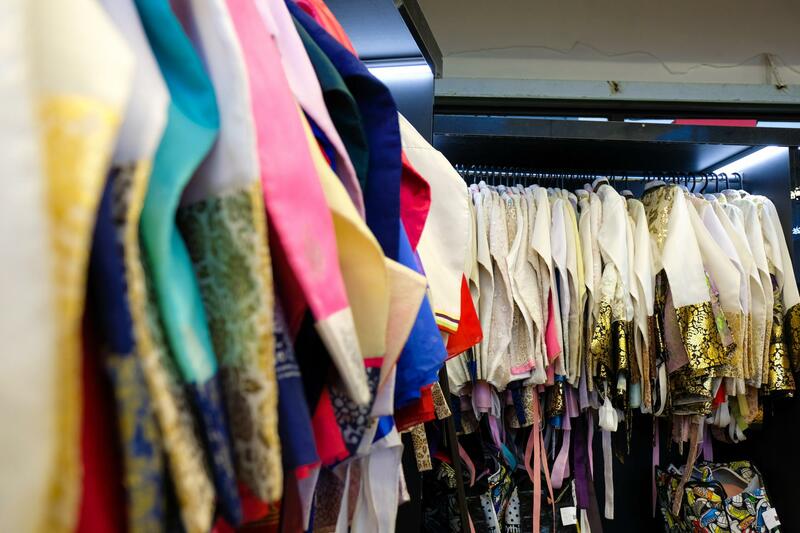 It specifically refers to clothes from the Joseon period but is worn nowadays often by tourists as well. 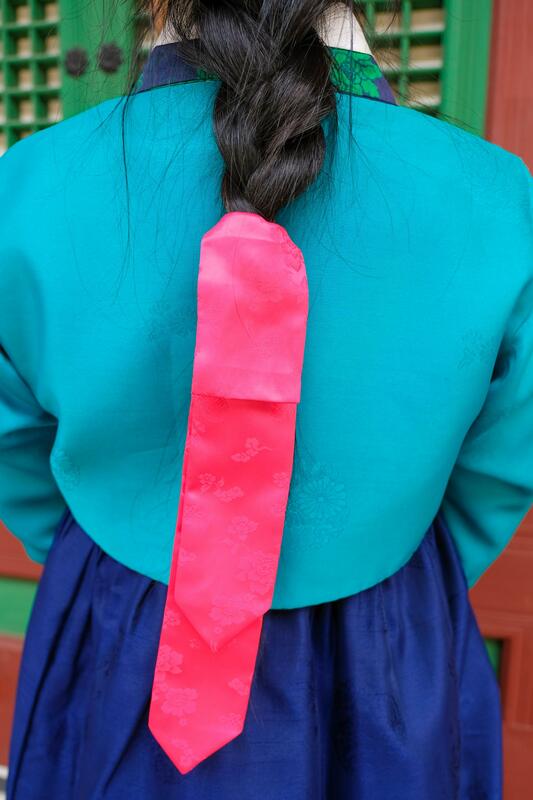 This beautiful blue and turquoise piece is rented from Oneday Hanbok. 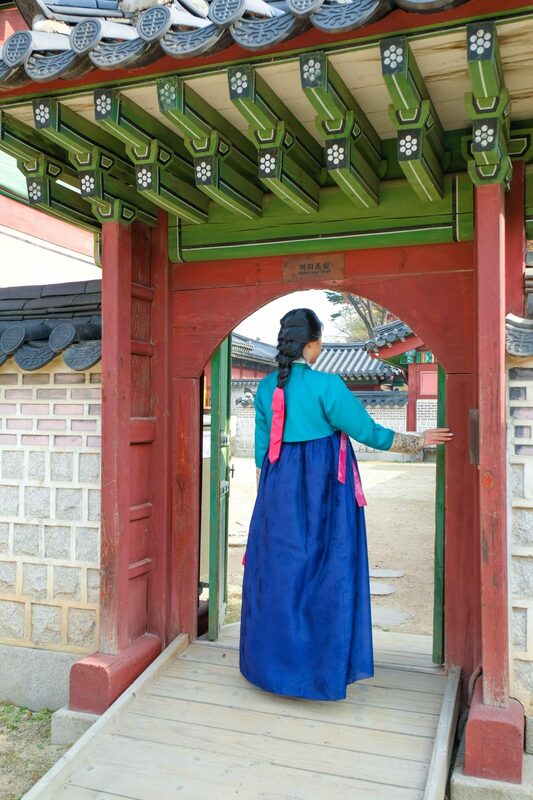 My visit was mid-November but since December 9th, they have officially relocated to Bukchon. Below are a couple photos from their old studio. 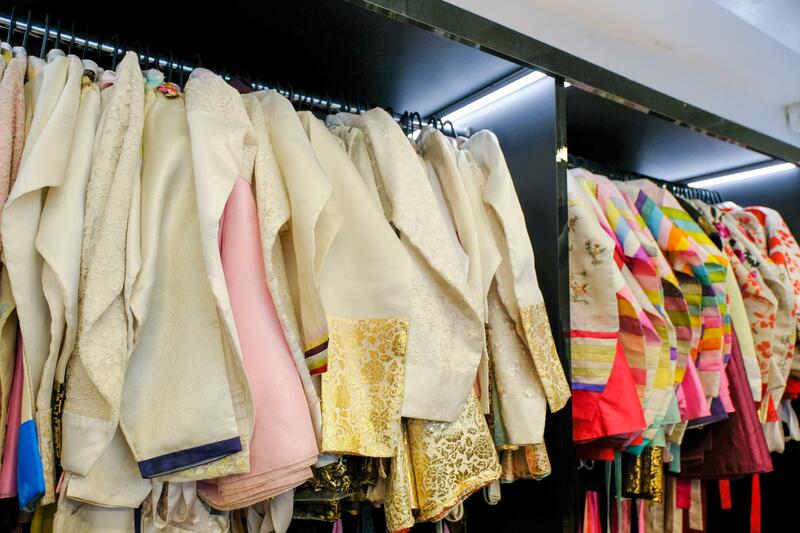 At Oneday Hanbok, there are endless choices ranging from simple designs, such as the one I’d chosen, to extravagant patterns and dazzling colors. 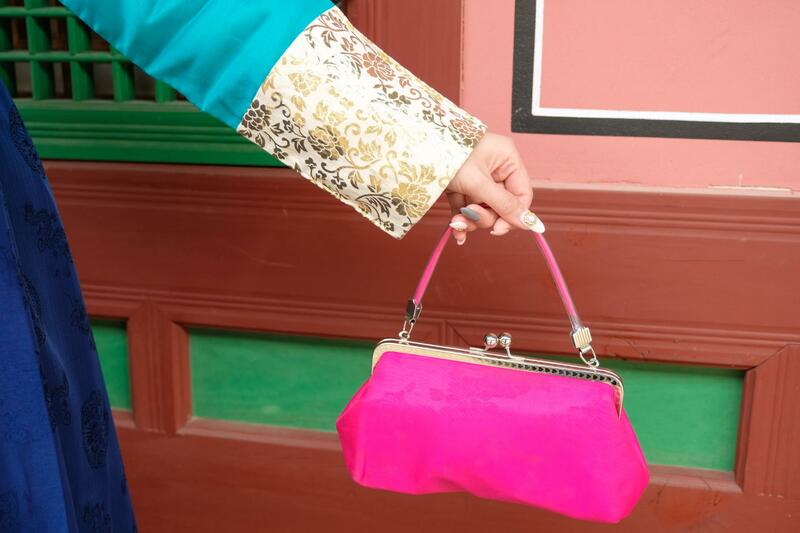 They also provide cute little purses and different types of hair accessories as well. Their hours of operation are from 10:00AM to 8:00PM. To book a rental, simply e-mail onedayhb@naver.com with your name, rental date and time, and the number of people renting. My appointment was made for Friday at 10AM and the place was crazy packed. 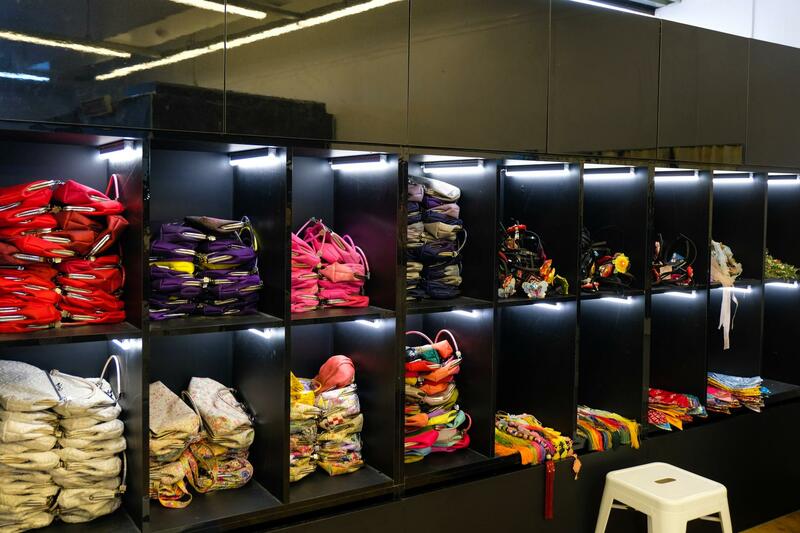 The staff explained to me their sizing system and each customer is allowed to choose two sets of hanboks. You can try both sets on and decide which one looks better. After the second set, if you are still undecided and would like to try on more, you will be charged an additional fee. I picked out 4-5 different outfits although only ended up just trying on the one. Now in terms of what to wear underneath, for colder weathers, make sure you don’t wear any turtlenecks or shirts with high collars, as these will peek through. 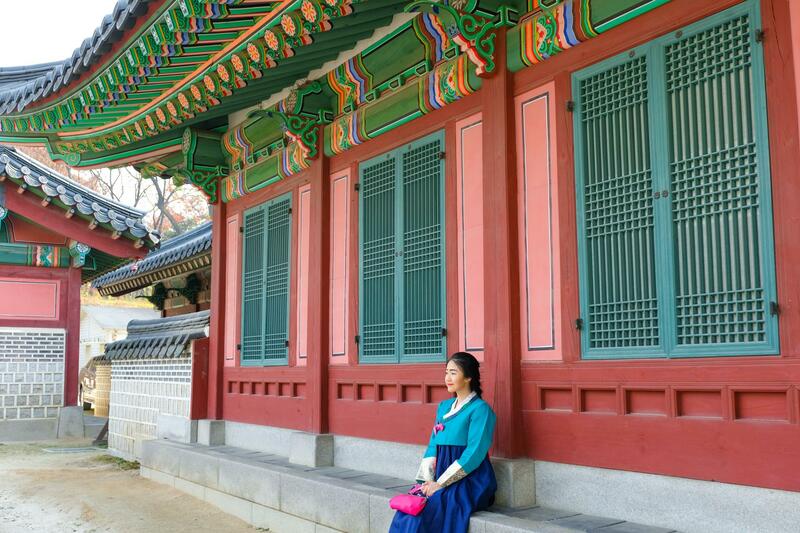 And if you are choosing a lighter colored hanbok, you won’t want to wear dark colored clothes underneath. Other than that you can pretty much wear anything. As for shoes, again, wear whatever you are comfortable with. However, do note that on rainy days, you will get a shorter skirt instead due to care and maintenance of these hanboks. Otherwise on regular days the skirt should cover your shoes and you needn’t worry about them showing in pictures. 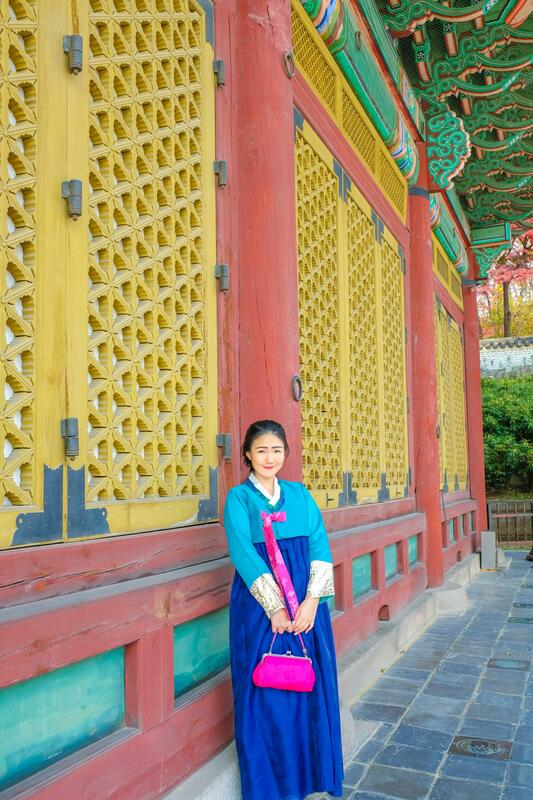 Unlike a kimono, hanboks are surprisingly easy to wear. There are two main parts – the jeogori (the upper blouse) and the chima (the lower skirt) – and everything is fairly effortless to slip on and off. The staff assisted with the changing process of course and also put my hair accessory in place. They, however, do not provide hair styling services. That said, my friend helped me to do a simple French braid and I definitely recommend this hairstyle as it is very, very flattering on young girls/ladies. 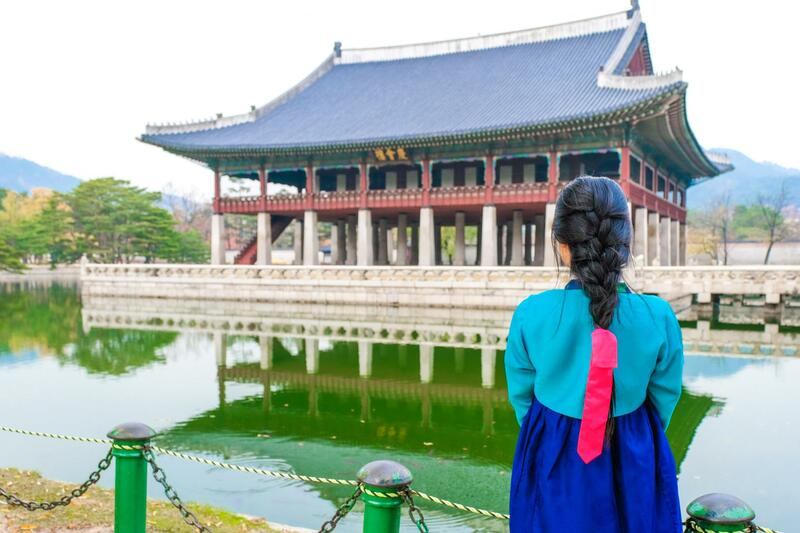 Another great reason to rent a hanbok is not only will you get to experience Korean culture first hand, you can visit palaces free of charge! And that is any palace. 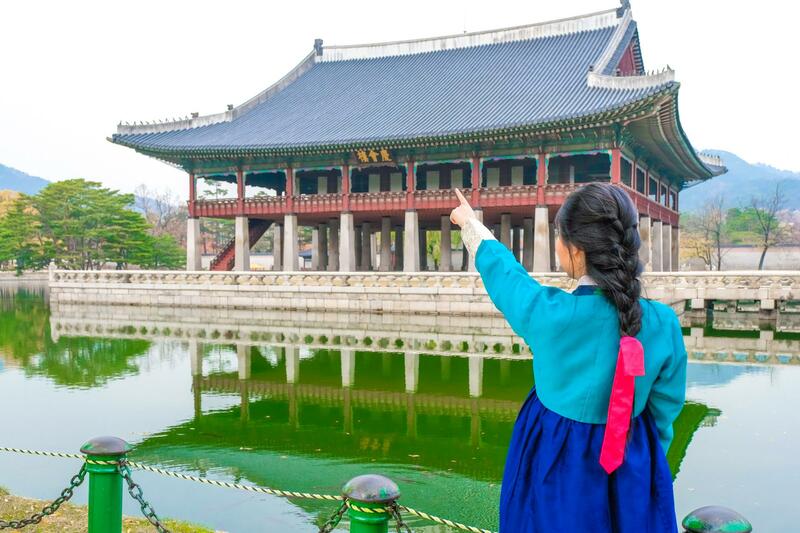 Gyeongbokgung Palace, Changdeokgung Palace, you name it. All admissions are completely free. Please do note that this is a sponsored post. However, all opinions are of my own. Prior to my rental process, I was in touch with the team and we spoke briefly. I introduced myself as coming from a Taiwanese background although of course it’s also quite obvious that my last name is of Chinese descent. 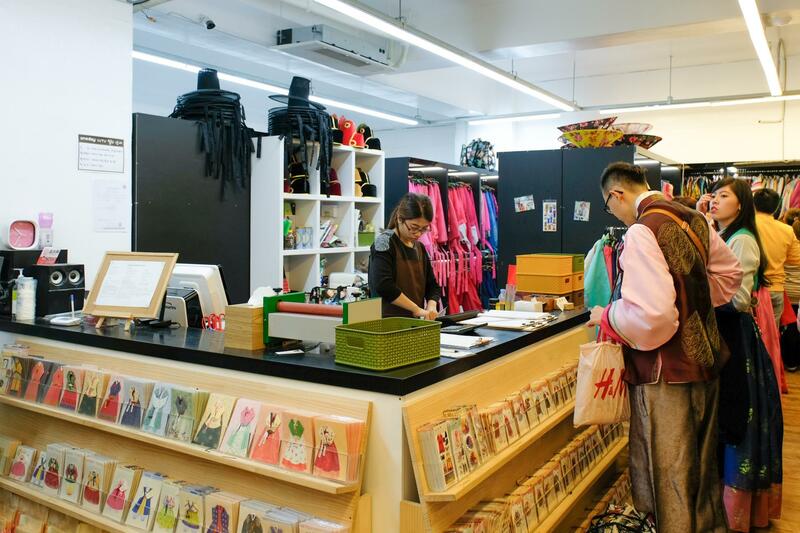 That said, on the day of my visit, not sure if it was deliberately arranged or just a coincidence, but I had a fellow Taiwanese girl help me out – in mandarin. Even though I was born in Taiwan, English has really become my primary tongue over the years but all good, I got by with my elementary-level communication skills. I did notice a lot of the customers were either from China/Taiwan/HK or Japan and so the staff mostly spoke Mandarin and Japanese. 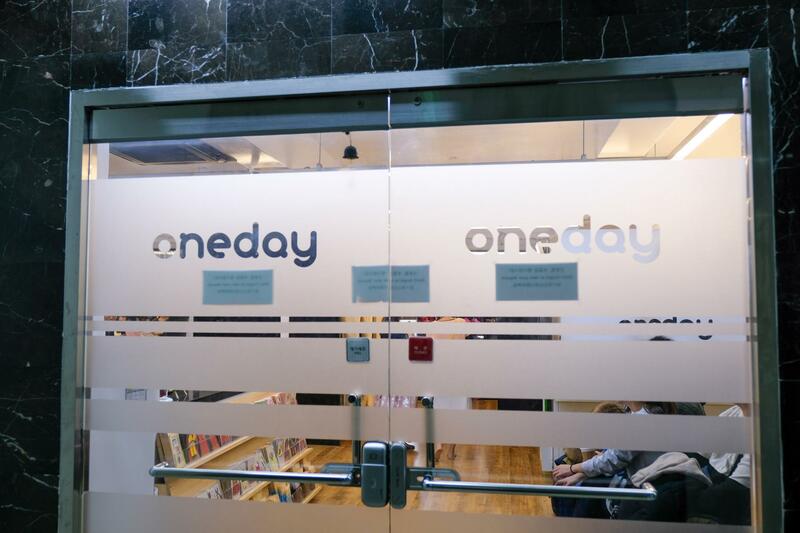 Oneday Hanbok does have an English section on their website and now that they have relocated, maybe they have more English speakers on site, I’m not sure. Regardless, speaking from my personal experience prior to the move, I would say if you’re a native English speaker and that’s all you know, prepare to do a lot of sign and body language. When I was visiting the palaces, I saw quite a lot of other tourists in even more ravishing robes. Some even seemed to be wearing a wire petticoat underneath to really keep their skirts nice and plump. There were also a few lovely ladies with gorgeous hairdos and pearls and crystals pinned throughout their hair. 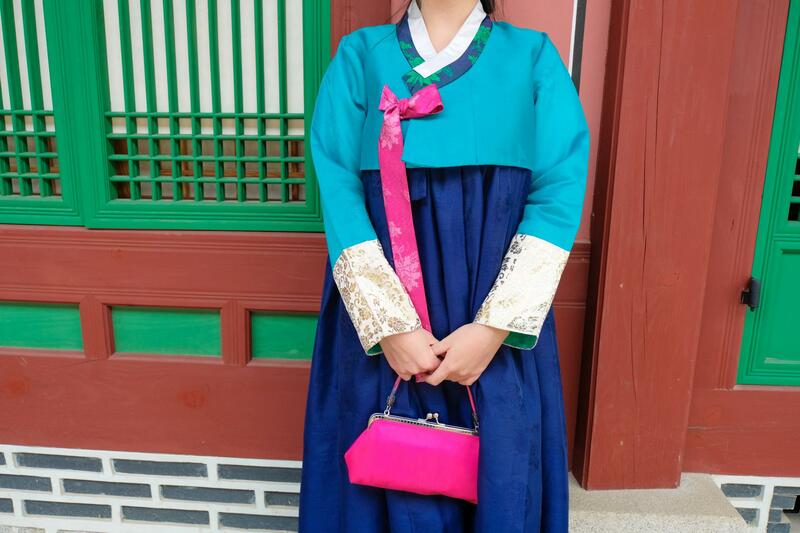 In comparison, Oneday Hanbok is not as fancy. That is not to say I didn’t enjoy the experience. Again, I picked out something really simple and that’s just me but I think simplicity is beauty. Plus if you were to walk around all day, something as extravagant as a wire petticoat and 20 bobby pins in your hair might not necessarily be comfortable. 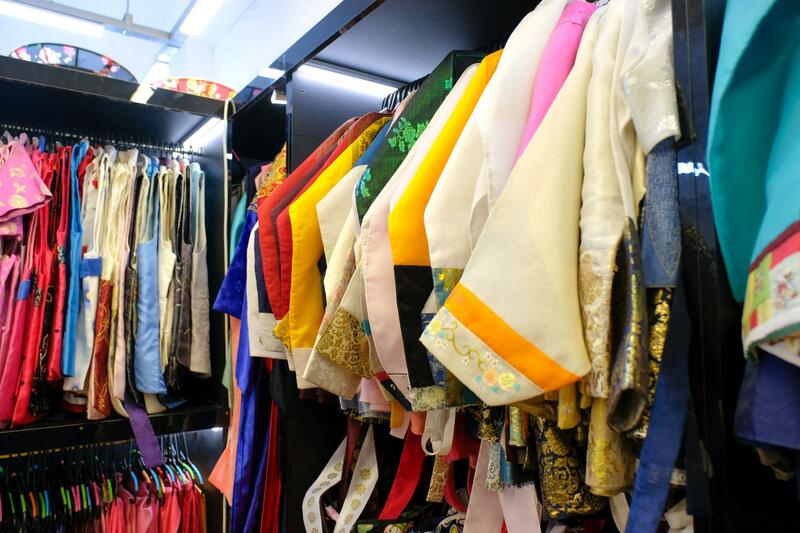 If you are looking for a hanbok rental in Seoul, definitely do check out Oneday Hanbok. Their renting process is very straight forward and you will most certainly have a great time frolicking the palaces in your new garment. Happy holidays in advance and see you in my next post! Aww that sounds like quite an amazing family trip! And props to you! So many people learn a language but never actually visit the country of its origin. Must’ve been an awarding experience and I bet you got a lot of good bargain deals seeing how the locals couldn’t take advantage of you not understanding! That is so cool that you can rent these beautiful traditional dresses! I find it quite strange that they charge your for trying things since the store seems like they have plenty of options. You look super cute in it, especially with your french braid! It’s amazing right!! I think they charge an additional fee when you reach the 2 outfit maximum because they’re soooo busy that they can’t have every customer try on 5-8 different robes. And thank you dear! Happy New Year!! Really pretty hanbok you got. The turquoise and blue suit you very well. Is entry to palaces really free? That is quite a steal then. OHMYGOD this is such a great post and i loveee all your photos! Thank you Vanessa! Happy New Year and wish you all the best for 2017!! Thanks dear, wishing you all the best for 2017! Thanks Janine. Happy New Year and best of luck in 2017! Seoul looks beautiful! Definitely on my travel wishlist. You look so cute too! Thanks Emma! Hope you get to check it off your list soon. Cheers! You look stunning. Love these photos! Aww thanks love, have a lovely day!